Very strange! Fancy asking someone in 1935 to copy a letter 157 times (that would be BY HAND), then giving that letter to 891 friends (I’m not sure how 157 letters becomes 891… and even you did have 891 friends [or even 157 friends] then no doubt you’d have to mail some of these HANDWRITTEN letters at YOUR cost…) and then 793 of those friends have to purchase these ‘cabin weekends’ so that you get 33 million cakes at 74 cakes a day for 54.5 years! Even using a calculator I couldn’t get that maths to work. 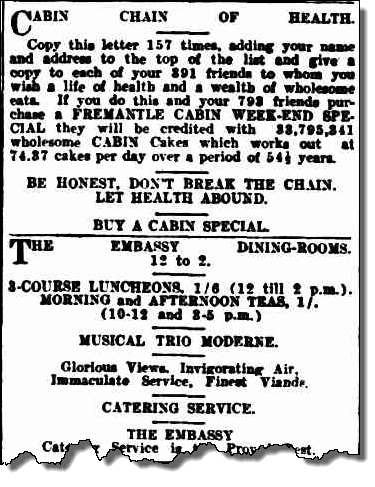 And there’s no information on how you go about purchasing a ‘Fremantle cabin weekend special’.